a toddler, he was captured, named Ivan, and caged in the U.S. and there he remained for three decades. 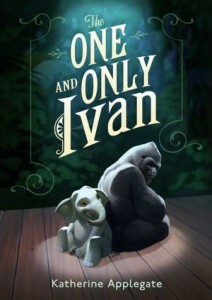 That true story is the inspiration for “The One and Only Ivan” by Katherine Applegate (Harper 2012). In Applegate’s story, Ivan lives at the tacky Big Top Mall and Video Arcade, along with Stella the elephant, parrots, monkeys and other animals that belong in a jungle, as well as a scrappy stray dog named Bob. They comprise a circus that is meant to draw customers to the mall. The animals live in filth, are not terribly happy, but they appreciate each other’s company. Each animal has his own wisdom. Bob the dog, in talking about humans who capture animals, says with disgust, “Humans. Rats have bigger hearts. Roaches have kinder souls. Flies have…” before falling asleep atop Ivan’s belly. Mack buys a baby elephant to try to boost faltering business. Stella is delighted to have elephant company. She asks Ivan to promise to help the new elephant. Due to Mack’s neglect, the circus befalls a terrible tragedy. Ivan has always drawn pictures, which Mack sells in the circus store. But when Ivan observes Julia, the daughter of the caretaker, using paints, he’s intrigued. Julia had given him his first crayon ages ago, and whereas they can’t talk to each other, she’s an intuitive girl. Julia brings Ivan paints, brushes and paper and he musters a plan. Ivan paints to express his feelings. He has the same frustrations as any artist. There are good days and bad. Could his painting draw the attention of enough people who would understand the plight of caged animals? That’s what he hopes. And that’s what the reader hopes. This is a gentle look at animal abuse, a topic which hits the hearts of many children and adults alike. The story is life-affirming—both animal and human. With lots of white space and charming illustrations by Patricia Castelao, this 300 page book is a fast and satisfying read. Patricia is a nationally touring speaker, children’s book author, storyteller, dancer. See her books on line at www.talesforallages.com She has new books coming out with Chronicle Books. well, we’ve got a lot of karmic debt, and to animals is a big one. Spoiler: Applegate’s story gives Ivan a relatively happy ending. 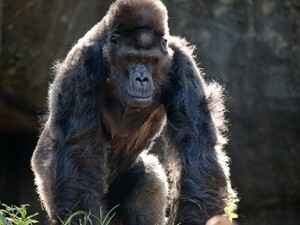 Ivan is released to Atlanta Zoo which has a big wild space for gorillas, he mates with a female gorilla and lives happily ever after. The real Ivan was released to Atlanta Zoo, which has a big wild space for gorillas, he never socialized with the other gorillas, but he did with humans, and died of relatively old gorilla age this last August after he became despondent.